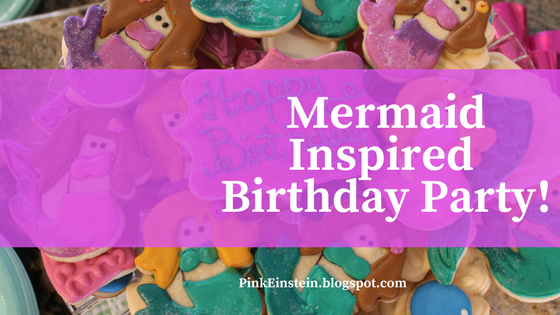 Life as Pink Einstein | Dallas Fashion and Lifestyle Blogger: A Mermaid-Inspired Party! My little sister turned 11 a couple of weeks ago and I was put in charge of being party planner so I had to come up with activities, decor, and run the party. I thought I would share a little bit of behind the scenes and how I decorated for the mermaid themed party. Here is the photo booth. I used a purple and green streamer backdrop and the poufs from my birthday party. Here's all of the photo booth props. There were colored wigs, grass skirts, and other tropical signs to hold up. My sister didn't want a cake so we got her these adorable cake pops from Kroger which were a huge hit at the party! Look at these cookies!! This is another reason she didn't have a cake because we got her these cookies. They are so cute!! My sister had a message board so she came up with a mermaid saying to put on it. We purchased these rings to give out as party favors and I displayed them in a little treasure chest I found in my brother's room and I filled it with loose pearls. Of course being middle school girls, one of the party activities had to be making slime. I hate slime. I found these slime making kits at Walmart that had all of the ingredients (except for contact solution) put together so it would make the slime making easier. The girls left Pudge exhausted!! So there is a little bit from the mermaid party! Hey, this Mermaid-Inspired Party is looking stunning and you had made really good decision to go all out with this type of color scheme and décor for this party. I am totally inspired and will love to use all of these ideas for my daughter’s birthday that I am planning to host at one of the rental spaces for parties.